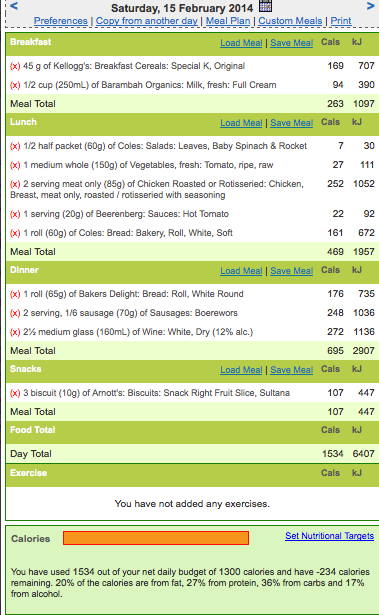 I ate a lot yesterday - going over my calories by a few hundred. By calorie counting, I can really see the impact that drinking wine has had on my waistline. I use alcohol to relax - sometimes drinking a glass or two during the week while I'm making and eating dinner. I never thought much about it because it was such a small amount. What I didn't realise is how many calories are in wine. Yes, I'm not completely daft. I know that alcohol adds lots of calories and that dieticians recommend that you reduce or cut it out completely. But it's only after seeing that it added another 272 calories to my day - contributing almost all of the amount that I was over my calorie budget - that I realise that alcohol can't be a weekly vice. It has to be budgeted into my daily meal plan. Just 35 minutes on the treadmill, walking uphill, will burn enough calories to make up for the additional wine calories. I'm adding this one to the list of ideas / hints. So here's what I'm going to do. I'm not going to stop drinking alcohol altogether. But I'm going to limit it to once a week - either a Friday or Saturday night. And I'm going to limit it to two glasses of wine. To make up for the additional calories, I'm also going to do more exercise on that day.